Powerful 3D printing tools for professionals, educators, and those who just love making. 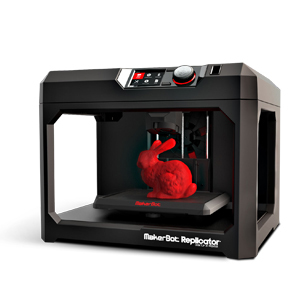 The new MakerBot Replicator sets a new standard in affordable desktop 3D printing. With a modular design, large build tray, and high resolution settings, this 3D printer will be your favorite tool in the toolbox. 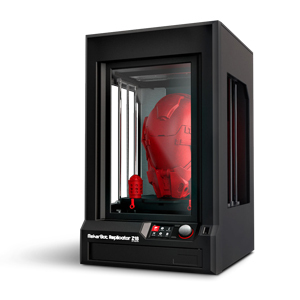 No need to be afraid of big 3D printing projects with the massive build volume of the MakerBot Replicator Z18. 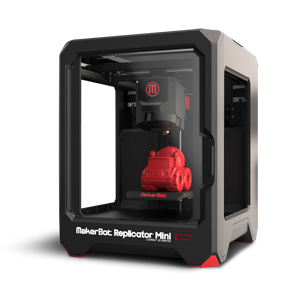 This easy-to-use 3D printer will enable you to think bigger Get started with 3D printing with the MakerBot Replicator Mini. This compact easy-to-use system will have you 3D printing your ideas in no time. 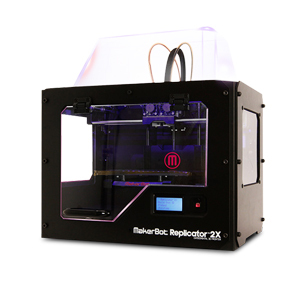 The MakerBot Replicator 2 is the 3D printer that started it all. This desktop unit is a workhorse, 3D printing your projects consistently and reliably without constant monitoring. Print two colours, or two materials, the choice is yours with the MakerBot Replicator 2X dual-extrusion 3D Printer. With the ability to use solvable support material no project is to complex. 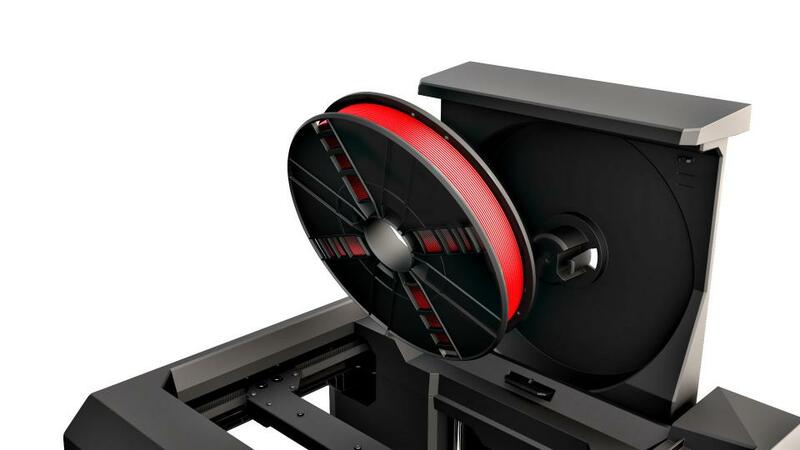 Be sure to stay stocked with the latest 3D printing filament and smart extruders available in multiple colours, and soon - wood, metal, and limestone. Assisted Leveling No Leveling Req. Fill out the form below to receive more information on our 3D printer product line. on the best solution for you. One of our 3D Printing Solutions Experts will reply to your shortly. FirstBuild is an innovation initiative founded by General Electric Appliances and Local Motors to engage with industrial designers, scientists, engineers, and makers to create the next generation of smart home appliances. By using MakerBot Replicator 3D Printers the FirstBuild team are quickly able to go from concept to prototype to validate their ideas. By rapid prototyping with 3D printers they have created a new model for inventing and then producing new products. Lockheed Martin and Nasa have teamed up to launch the largest infrared telescope into outer space. The James Webb Telescope will be a feat of human engineering and is currently being developed at Lockheed Martin's Advanced Technology Center. 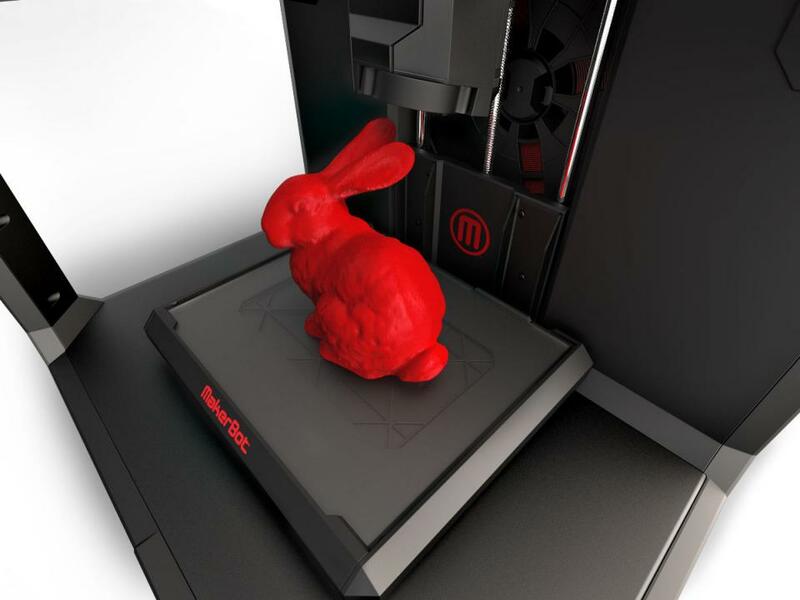 Although it is a massive undertaking, MakerBot 3D printers played a big role. They were able to provide quick concept iterations for the engineering teams to validate. The Feinstein Institute for Medical Research is the research branch of North Shore-LIJ Helath System and is committed to research, innovation, imagination and discovery in the healthcare field. A team of surgeons and scientists were recently able to grow cartilage for damaged or diseased tracheas or windpipes with 3D printed scaffolding on their MakerBot Replicator 2X 3D printer. Through this project they have reliased the limitless potential for desktop 3D printing in medicine. Product Designer Bill Phelps is anything but new to the world of rapid prototyping. After exhausting extensive capital on expensive prototyping technologies, Bill bought himself a MakerBot Replicator 2 3D printer. Him and his team at Ringblingz were quickly able to worth through hundreds of prototypes and design iterations in their quest to design the perfect wearable companion for teenagers. Orbotix, now known as Sphero, is an innovative toy development company with a focus on robotics. Cofounder Ian Bernstein dreamed of creating connected toys that provided the user with versatile options for enjoyment. The Sphero, their first product, came to life with the help of a MakerBot Replicator 2 3D printer. The ZBoard was an idea conceived from a team at the University of Southern California. It was designed to encourage more efficient personal transportation for students and yonug professionals in California without sacrificing fun. 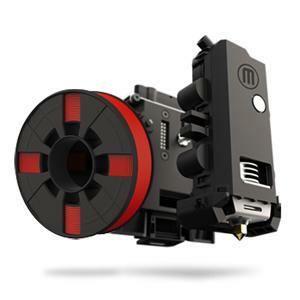 The initial concept turned into a 3-year development process and a new company - Intuitive Motion Inc. MakerBot Replicator 3D Printers played a big role in developing final designs and rapid prototyping. Architecture firms have become big users of 3D printing. It is sometimes necessary in visually communicating a future project or design for stakeholders. With 3D printing a simple 3D CAD model can come to life and be used as a presentation tool. Perkins+Will is an 80-year old research based architecture firm specializing in a variety of disciplines. They leverage advanced technology like 3D printing as communication tools for potential customers. Kisi is a startup company located in New York. They focus on producing cloud enabled access control to ensure safety and security within the enterprise. 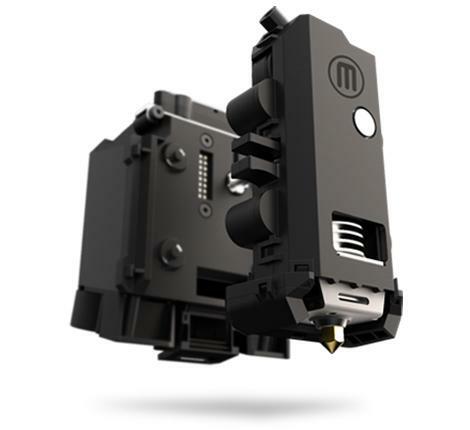 By using MakerBot Replicator 3D Printers the engineering team at Kisi is able to rapidly prototype both their hardware and software in-house and facilitate flawless integration. Their ability to 3D print provides creativity freedom in their hardware designs, and a customized solution for their customers. "On Such a Full Sea" a novel by Chang-rae Lee has 3D printing integrated into a special edition slipcase cover. The slipcase was printed on a MakerBot Replicator 2 3D Printer with the purpose of representing the futuristic setting of the novel. This unique concept adds a tactile element to traditional reading. Whitby School used 3D Printing to encourage their grades kindergarten to 12 students to rethink the world they live in and come up with unique ways to solve problems. Leslie Perry, the teacher leading the program, feels that the 3D printers in the Design and Technology classroom creates a new degree of enhanced education. The Pratt Institute of Architecture uses MakerBot Replicator 3D Printers to produce concept and study models. The inclusion of 3D printing into the curriculum has enhanced students visual learning of architecture design concepts. By being able to hold their ideas in their hands, students are able to see them more objectively. Being the largest specialized high school for STEM (science, technology, engineering, and mathematics) based learning in the United States means being on top of emerging technologies that would enhance learning. Brooklyn Tech immediately saw the opportunity for 3D Printers in their rapid prototyping lab. 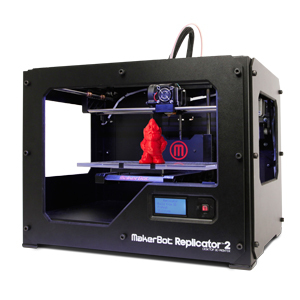 The MakerBot Replicator systems brings low-cost 3D printing to the students. Sebastian Errazuriz | "12 Shoes for 12 Lovers"
Traditionally shoe-making is a rigorous process that involves hands on dedication and not a whole lot of creative freedom. Sebastian Errazuriz attempted to challenge the status quo with his new shoe exhibit "12 Shoes for 12 Lovers". The artist combines the world of design, art, and fashion to create unique experiences. In this exhibit he used a MakerBot Replicator Desktop 3D Printer to represent the male and female dynamic. Francis Bitonti leverages advanced manufacturing technologies to create sustainable production in the fashion industry. Many of his projects aim to blur the lines between fashion and technology with a focus on customization for the masses. With his Bristle Dress project, MakerBot Replicator Desktop 3D Printers were used to create it in two materials; Flexible and natural PLA. The dress is an icy representation with the files available for customization through the Thingiverse website. Carrie Mae Rose is a computational fashion expert who uses advanced technologies to push fashion and art to their limits. Her "Light As a Feather" exhibit presents a series of illuminated wearable sculptures which integrate technology, to better visualize unseen forces as they relate to the human body. The exhibit came to life with the help of a MakerBot Replicator 3D printer, which allowed for complete design freedom in 3D printing her models.